I guess you could say I came into this position cold. I started as the coordinator for the Chesapeake Bay Sentinel Site Cooperative (CBSSC) in January, relocating from my hometown of Orlando, Florida. It proved a dreary contrast: I saw rain, snow, and gray skies for my first few months traveling around the Chesapeake. Fortunately the reception for my work was warmer. My job is to bring people and data together. The Chesapeake Bay is one of five National Oceanic and Atmospheric Administration (NOAA) Sentinel Site cooperatives in the United States. The other four are in North Carolina, the northern Gulf of Mexico, San Francisco, and Hawaii. Each location is a hot spot for ecological monitoring and illuminates the threat of sea level rise for the region. Here in the Chesapeake Bay, we are studying the effects of sea level rise on coastal ecosystems and communities across the Bay region. We use findings from the research and scientific data to inform planning and management decisions. The Chesapeake Bay has seven sentinel sites in Virginia and Maryland, mostly on federal and state lands. Each site brings its own strengths, such as the efficacy of restoration approaches, conservation strategies for rare and endangered species, or the response of marshes to experimental manipulation that mimics human disturbances. They are deemed “sentinel” because they each conduct a suite of long-term, local observations for their marsh ecosystems that include meteorological data, water quality, vegetation sampling, surface elevation tables, and water levels. Affiliated partners may collect a subset of this data or lead similar research that feeds into the cooperative’s goals. The management team includes stakeholders who make use of the data for land use decisions or community outreach. Because scientists monitor so closely, the sentinel sites are a good indicator of the marsh’s health. Networks of marshes are crucial across the Eastern Shore. They provide habitat, protect communities from flooding, and increase biodiversity. The data can help predict how other marshes might be faring. 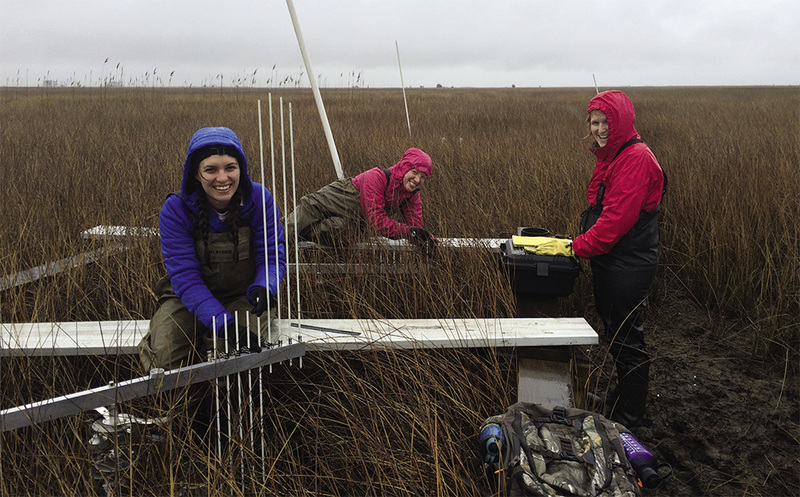 The CBSSC has narrowed its focus to sea level rise impacts on marsh persistence, given the breadth and depth of research occurring here, as well as its rising threats. As of 2010, the Bay had approximately 282,291 acres of marshes; the Chesapeake Bay Program aims to reestablish another 85,000 acres by 2025. Marshes produce a suite of ecological services, including improved water quality, flood reduction through wave attenuation, and erosion protection. They also provide essential nursery habitat for commercial fisheries and habitat for other wildlife. The Chesapeake Bay region, however, has the second highest rate of sea level rise in the continental United States, after the Gulf of Mexico. These wetlands are systematically complex, where numerous inputs (sediment supply, topographic setting, nutrient levels, vegetation type, and herbivory) can lead to uncertain outputs. If sea level becomes too high, marshes will drown. But some marshes can adapt or be restored. Instead of focusing on the particulars of a single site, the cooperative approach considers different types of marshes, broadening our assessment of the Bay’s overall wetland longevity. I completed an MS in conservation biology and sustainable development at the University of Maryland, so the terrain was not completely unfamiliar to me. But in the Chesapeake Bay region, you can drive a couple of hours and be in a different world. I traveled to marshy expanses on Maryland’s Eastern Shore, restored marsh sites on Poplar Island near Tilghman Island, and research laboratories at the Virginia Institute of Marine Science at Gloucester Point. The road trip offered a way to learn about the geography and the people, with the hope of gathering the science and assembling the scientists for collaboration. Sometimes, the inquiry is more specific. 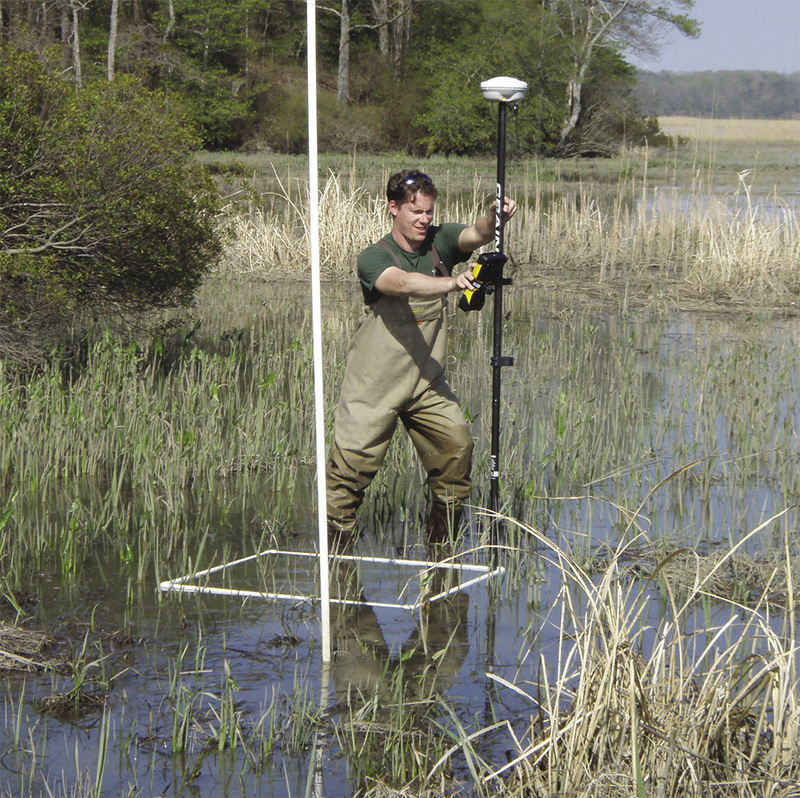 At Jug Bay Wetlands Sanctuary in southern Maryland, biologists realized that the physical platform where they had installed their water level sensor was unstable. The function of the sensor is to measure and calculate the standard elevation for a tide, which then determines mean high water, mean sea level rise, and other measurements. Because the sensor was moving, how could they take an accurate measurement? The biologists shared their error and discovered that this problem could be systematic at CBSSC and other sites. As a result, the National Estuarine Research Reserves now monitor and document whether the appropriate infrastructure and leveling protocols are in place. We are able to ensure that our platform is secure so that our numbers are reliable. The cooperative members have been collaborating for years — and it’s taken all that time to build trust and camaraderie. Their best intentions to work together on new, larger-scale projects can easily get passed by, given the demands of field schedules. It takes time to reach consensus on what scientific questions to ask, what procedures to follow, and how individual research aligns with these joint efforts. One common data collection element among the sentinel sites is surface elevation tables (SETs). These portable devices have nine movable pins attached to a metal arm; the arm locks into a permanent benchmark installed deep into the surface of the marsh. (The table moves; the benchmark does not.) Each year, the same scientist lowers the pins to the marsh surface and measures the height of the pin above the metal arm. Compared against the benchmark, measurements of pin height tells us precisely whether the marsh is rising or sinking over time. 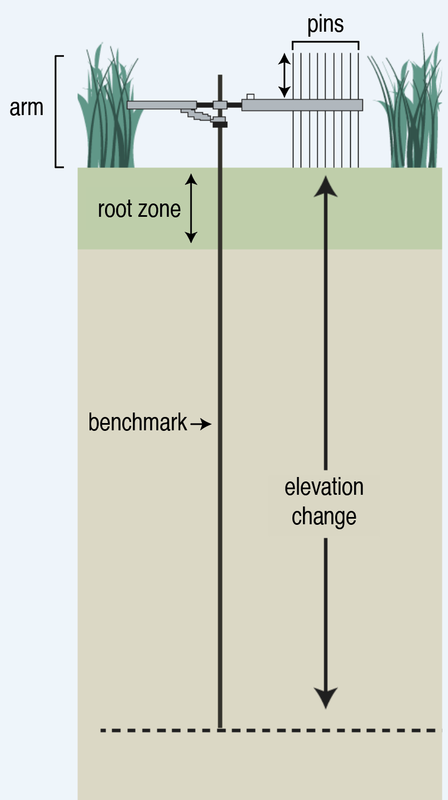 Tracking this elevation change is a core indicator for how a marsh can withstand sea level rise. It’s a race of millimeters on a decadal time scale. A permanent pipe or rod deep (3–25m) in the ground serves as a stable reference point for comparing changes in pin height. A metal attachment fixed to the benchmark holds nine movable pins. Lightweight, fiberglass rods measure change. The growth or decay of plants influences changes in wetland elevation. Once or twice a year, scientists lower the pins to the marsh surface to measure the height above the metal arm. If the pin height increases, the marsh bed is rising; if it decreases, the marsh is losing elevation. It made sense for us to list the SETs at each sentinel site and the geographical characteristics at each SET sampling station. As it turns out, there are more than 400 SETs nestled in Chesapeake Bay marshes. As the coordinator, I worked closely with each site to compile their SET locations and key characteristics (e.g., salinity regime, vegetation community, installation date, sampling frequency) for each of the SET inventories. The CBSSC scientists updated their SET inventories in a database and agreed to share this information with members and the public. This was a huge deal: researchers are protective of their data, and they don’t want their hard work to go unrecognized or their results to be misconstrued. Those years of building trust weren’t for nothing; members encouraged other members. As some sites moved forward, others followed. Leadership, baby steps, and a stroke of good fortune have gone a long way. A newly hired NOAA geographic information systems specialist turned this list into an interactive map, now live and accessible to the public. We believe it is the first of its kind. Our 400 SETS of data can tell us, for example, whether a marsh is degrading. Scientists have established that a degraded marsh cannot support the typical amount of wildlife when it starts falling apart and eroding. As a result, habitat and recreation uses are lost, and proximal communities are placed at greater flood risk. We can slow marsh degradation if we can identify and implement proper restoration. Alternatively, we may learn that a particular marsh is facing insurmountable threats and that our resources could be more effective if used elsewhere. When we have a network of information, we strengthen and expand our research. With everyone at the table, we also see where we need to invest more research or resources. With strong data, we can make predictions and set priorities. The sentinel sites are able to speak for the Chesapeake Bay as a whole. Working together leads to new insights — it just requires coordination and cooperation. Taryn Sudol is the CBSSC coordinator; her position is supported by the National Sea Grant Office, National Ocean Service, and Maryland Sea Grant.